Creganna Medical provides a turnkey design and manufacturing service for complex specialty needle devices. 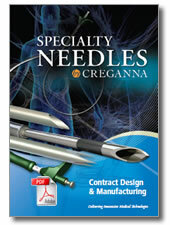 Creganna Medical is a single source supplier from handle to tip, specializing in sophisticated needle designs. Finished devices, assemblies and components across metal, polymer and composite materials are available. 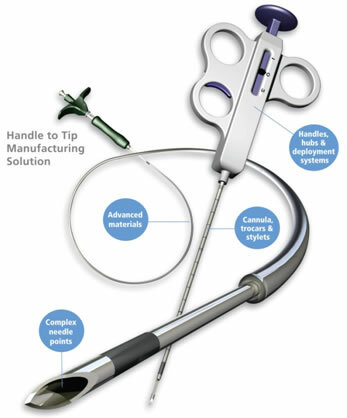 Creganna Medical’s sophisticated manufacturing processes enable a seamless manufacturing solution for specialty needles from handle to tip including needle point design & manufacture, cannula, trocars & stylets, needle shaft marking, needle shaping, echogenic enhancement, handle, hub and deployment mechanisms. 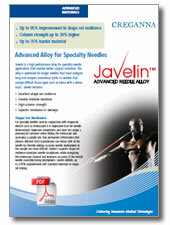 Javelin™ is a high performance alloy for specialty needle applications that enables better surgical outcomes. The alloy is optimized for longer needles that must navigate long and complex anatomical paths or needles that sample difficult tissue types such as those with a dense mass.